Happy day there stampers. Today's share is a quick card that i am planning on sending to a friend of ours that is going through a bit of a hard time. Just to let them know that our family is thinking of them and that we are sending ... well "Good Thoughts" their way. The base of my card is using the Basic Black and is average size of 4 1/4" x 5 1/2". My middle piece is cut 1/4" smaller on all 4 sides and is the Color Tempting Turquoise. 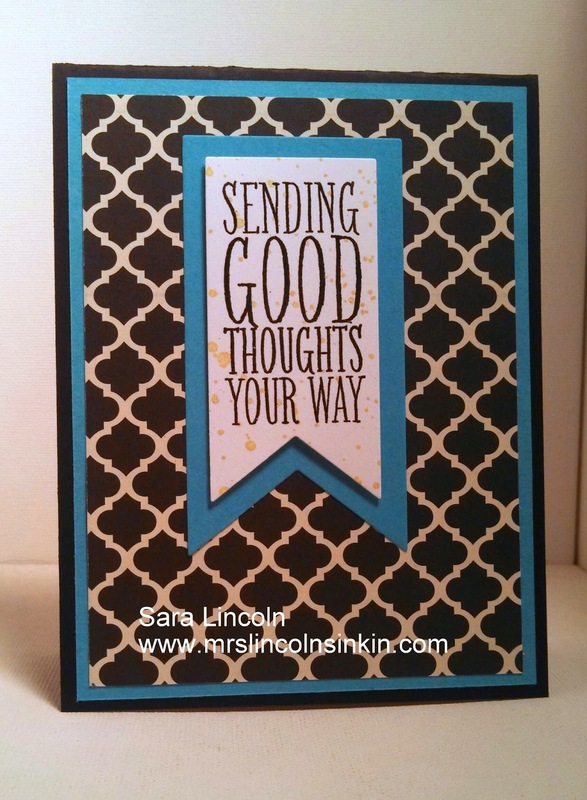 My top piece is using the DSP Modern Melody (i LOVE this Designer Series Paper). For my vocal piece i used a simple banner that is cut from the Banner Framelits which are in the Occasion Mini right now. I used 2 different sizes and backed my Whisper White piece with Tempting Turquoise again to kind of tie it all together. The stamp set that i used today is called Perfect pennants which is also available in the Mini.